► Which is the best £25-30k load-lugger? Ford Mondeo Estate …defined the family sector for 20 years. On sale in the US since 2013 but delayed so long before arriving in Europe last winter the facelift is due any day. Move to premium cars and SUVs has decimated sales. VW Passat …bridges the gap between mainstream and premium. The badge has been around since ’73, but this Golf 7-based eighth-gen car – European Car of the Year 2015, no less – is new for this year. Slinky CC coupe still based on the previous Passat. Mazda 6 Tourer …desperately wants to be a 3-series, and is building a strong fanbase with its blend of tidy handling and practicality. Recent facelift boosted interior quality, soundproofing, and suspension to improve refinement. BMW 320d Touring …has spent the last 40 years helping kill off volume family cars like the Mondeo. Prides itself on its rear-drive make-up, although there’s also an xDrive 4wd option. Facelifted since this test, adding standard nav, cleaner diesels, a 330e hybrid and an entry-level three-cylinder 318i. Ford Mondeo Estate …park it nose-out so that everyone can see that imposing Aston-like snout. Actually, they won’t have much choice, because the Mondeo is enormous, almost as long as a Merc E-class. VW Passat Estate …shove it in the directors’ bays right near the main entrance because the thing looks so damned smart no-one’ll think twice. This trick is reserved for GT and R-Line buyers only, mind. Mazda 6 Tourer …not have to try too hard to remember where you parked it, because it’s handsome enough to stand out in a sea of repmobiles. Sport models with their graphite-coloured 18in wheels worth the extra spend. BMW 320d Touring …have come prepared by ticking the model designation-delete option in the vain hope of convincing people there’s actually a straight-six under the bonnet. Efficient Dynamics model comes only on weedy 16in wheels. Ford Mondeo Estate …you’ll be transported to a time before people moaned about dash plastics. And you’ll remember why touchscreen systems – particularly slow, slanted ones with graphics so small you almost need a stylus to touch them – are such a bad idea in 1600kg objects doing 80mph. VW Passat …you’ll be wondering how VW manages to do it for the money. This is as good as anything from Audi and you can even option your new Passat with the TT’s full-width Virtual Cockpit TFT gauge pack, which VW calls Active Info Display. Mazda 6 Tourer …you’ll think you’ve got into your old previous-gen 3-series. From the design of the centre-stack to the iDrive-like controller at its base, it’s pure E90, but updated with a touchscreen display and materials that don’t imbue it with the BMW’s Abu Ghraib ambience. BMW 320d Touring …you’ll not be able to stop thinking about how much nicer Keith from marketing’s new Merc C-class is inside. Then you remember he was too tight to pay out for sat-nav. Facelifted 3-series get it as standard across the whole range. Ford Mondeo Estate …the Mondeo isn’t quite as commodious as its gargantuan length might suggest. Only the BMW offers less luggage space and the Passat trounces it. But it makes up for it with acres of rear passenger room. VW Passat …the Passat is unbeatable, far bigger in the broad boot than even a 5-series BMW, let alone its little brother. Rear-seat room is impressive too, and the flat bench makes life bearable for a fifth bum. Mazda 6 Tourer …Mazda pulls off a surprise by outpointing the Mondeo despite that handsome sloping fastback rear. The boot is wide and the floor usefully flat, but when it comes to rear passenger room, the still-roomy 6 bows to the Ford. BMW 320d Touring …the BMW offers the least space: fractionally less with the seats up, but at least 100 litres off the next worst with the seats flattened. The rear seat is more cramped too, but you do get a useful flip-up rear window in the tailgate. Ford Mondeo Estate …that it feels almost how you’d hope a big Focus would feel. Less pious than the Passat, better mannered than the Mazda, it rides well and changes direction keenly. But load it with luggage, then load the tyres up in a series of bends, and you’ll be wishing for tighter body control. VW Passat …sinking your right foot into the carpet and watching the other three disappear backwards. The 187bhp VW is almost a second quicker to 62mph than the Mondeo, and even the brisk BMW can’t keep up. Handling is safe, not exciting, but refinement is excellent. Mazda 6 Tourer …the feeling of being in on a secret nobody knows about. The 6’s 173bhp diesel is gustier than its 8.6sec 0-62mph time suggests, thanks to a colossal 310ft lb of torque. It’s genuinely agile too, great fun on B-roads, and rides better post facelift, but the steering’s still over-light. BMW 320d Touring …not that the driven wheels are at the back, but that 50% of the weight is. Even this eco-infused Efficient Dynamics model on its CO2-friendly tyres feels responsive and alert. Performance from the 161bhp diesel is urgent and the eight-speed ZF auto is excellent, but mechanical refinement poor. Ford Mondeo Estate …run and hide behind the nearest fake tree so he can’t castigate you for spending a fortune on fuel. The Mondeo’s the thirstiest car here, and the highest CO2 will cost you more in company car tax too. VW Passat …remind him that while the Passat isn’t the cheapest car in its class, it is well equipped, and that strong residual values aren’t just good news for private buyers, they help keep leasing costs down too. Mazda 6 Tourer …apologise profusely for optioning your 6 with the six-speed auto ’box. It’s a conventional auto, not a dual-clutch and clobbers mpg. He’ll tut, and say you should have gone for the thrifty 148bhp diesel while you were at it. BMW 320d Touring …greet him with one of those bicep-bulging ‘bro’ handshakes that even car bosses use these days. The 320d uses the least fuel and the greenest of the facelifted cars ducks under 100g/km, so it’s road-tax exempt. Ford Mondeo Estate Much to recommend, including massive cabin space and able chassis. But it’s slowest and thirstiest, and the interior feels like it’s made of old Happy Meal toys. VW Passat Handsome shape, stunning interior, stonking performance. Okay, so it’s a bit sensible, but these are sensible cars and this is the most sensible place to put your (or your boss’s) money. Mazda 6 Tourer Stylish 6 is good to drive and excellent value, but if you prefer two pedals to three, the auto ‘box does to its green credentials what the SNP did to Labour. BMW 320d Touring Still great to drive, but it’s out-ranked on space and – despite wearing the only true premium badge here – cabin quality and refinement too. Not the ultimate load-lugging machine. 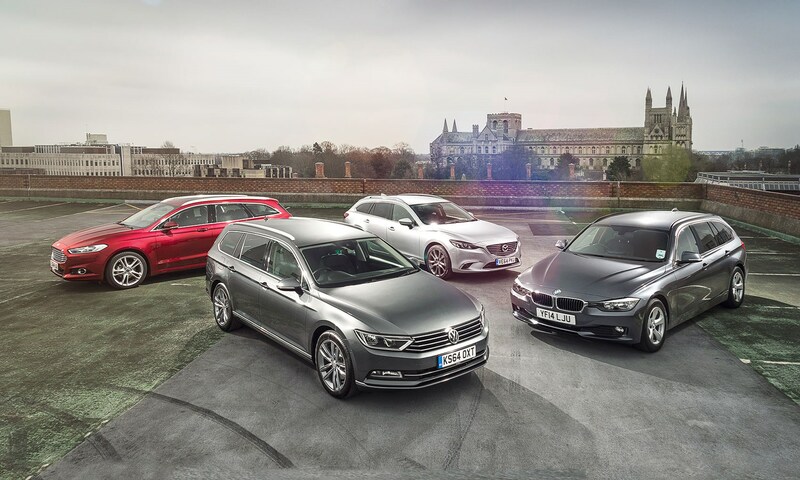 And the winner is: the VW Passat Estate.